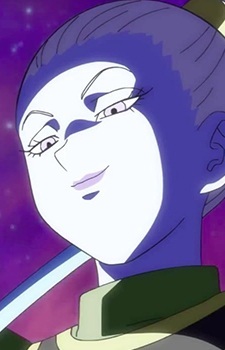 Vados is Champa's attendant and the older sister of Whis. She is implied to be the strongest character in the series so far. She is introduced with Champa as they destroy planets across Universe 7, looking for a specific one. Sometime after Goku kills Freeza, they visit Whis and she watches as Champa and Beerus have a "food showdown". Champa is won over by the tastiness of Earth's instant ramen and Vados regrettably informs him that the Earth in their universe (Universe 6) was laid barren thanks to a war waged by humanity. Champa then challenges Beerus to a 5-on-5 battle where they will handpick fighters from their respective universes. The prize will be Universe 7's Earth!